In Boston, they have snow. In Seattle, it's rain. Here in San Francisco, fog is our most temperamental natural element, and it's often as cold and as brutal as a blizzard! This may be a slight exaggeration, but it’s still not the best weather for your typical S.F. adventure. Still, there's no need to fret: SF has plenty of fun activities to keep you going even when "Karl the Fog" has decided to (literally!) hang around for months on end. One way to face him is to simple embrace him, but that's a bold suggestion, so we've got other ideas as well. SF's fog can chill you to the bones, so why not warm up by snuggling with kittens and sipping hot herbal tea? Welcome to KitTea, a tea room in Hayes Valley that serves double-time as a playground for adoptable kittens. There's no need to worry about hairballs in your mug: the tea and kitty lounges are separate for sanitation purposes. We recommend booking ahead, simply because cats are adorable and everyone wants to cuddle with them, but walk-ins are also welcome if space permits. Hiking among the eucalyptus forests of San Francisco's beloved Presidio is almost ethereal in the fog. Pack on the layers and go wandering amid the park's old military barracks and toward cliffside overlooks offerings prime views of the Golden Gate Bridge and San Francisco Bay. Or take a stroll down the Lovers' Lane trail, then past Andy Goldsworthy’s Wood Line sculpture for the ultimate fog-laden adventure. You can also climb down to beaches like Baker Beach or the more secluded Marshall's Beach for a bit of fog-day solitude, though bring a blanket and wrap yourself tight. When you’ve gone days (or weeks!) without the sun, it’s easy to forget it exists. Thankfully, it's fairly easy to rise above the fog line. Simply head north over the Golden Gate Bridge to Marin for either a drive or a hike up to the top of approximately 2,570-foot-tall Mt. Tamalpais, which peeks out from atop the fog blanket. 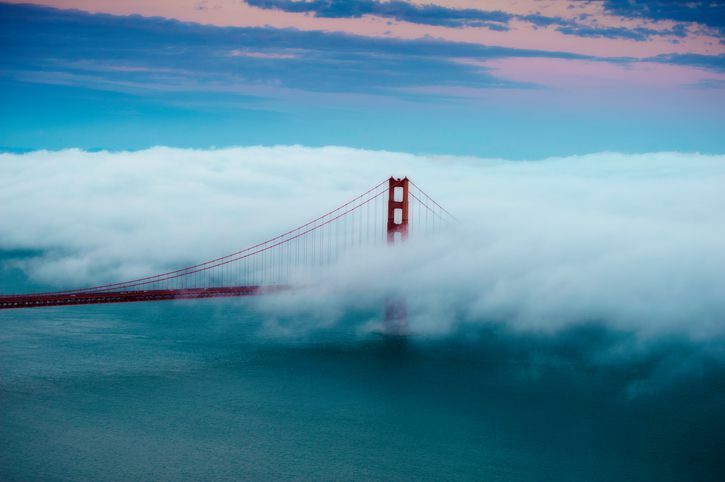 It's an almost surreal beauty, and one that reminds San Franciscans that maybe—just maybe—Karl the Fog isn't really so bad. Pro tip: stay until sunset for a fantasmical kaleidoscope of changing colors playing off the clouds. While afternoon imbibing can be fun, there are plenty of bars and cafes in San Francisco that offer alternative forms of entertainment. Nob Hill hangout Zeki’s on California Street has Connect Four board games and fireplaces perfect for getting cozy. In the Outer Richmond, neighborhood stalwart Simple Pleasures Cafe has puzzles on hand to help while away an afternoon. The Sycamore in the Mission is "the place" for Twister with strangers paired with chicken and waffles, while Lower Nob Hill's Golden Gate Taproom is basically an adults-only arcade with everything from shuffleboard to Foosball, Skeeball, and pool. Grab your posse and stake your claim for the better part of a day. There's so much to see in the SFMOMA (home to seven floors of exhibit space) that it could honestly take you days. After a lengthy three-year expansion, this modern art entity reopened as the largest museum of its kind in the U.S. Whether you’re going through it with friends or just taking time to reflect on the displays on your own, it's easy to spend hours perusing hundreds of incredible works by artists like Pablo Picasso and Diane Arbus. For easy refueling, there's both a third floor coffee bar and a café on the seventh, and don't miss the rooftop sculpture garden: it's well worth braving a little fog. San Francisco's independent bookstores are easily one of the most rewarding ways to spend a foggy afternoon or evening in the city. The legendary Green Apple Books in the Inner Richmond is filled with seemingly endless nooks and crannies, not to mention shelves full of alternative worlds galore. In the Haight-Ashbury the longstanding Booksmith and its newer annex, The Bindery, offer a wealth of fun literature finds. While the former is known for its evening author readings the latter boasts book titles according to decades, and hosts events such as silent reading parties and even the occasional beer pouring. The Book Passage is an ideal Ferry Building hangout between gourmet samplings; for LGBTQ lit, Dog-Eared Books in the Castro stocks the ultimate foggy-day finds.